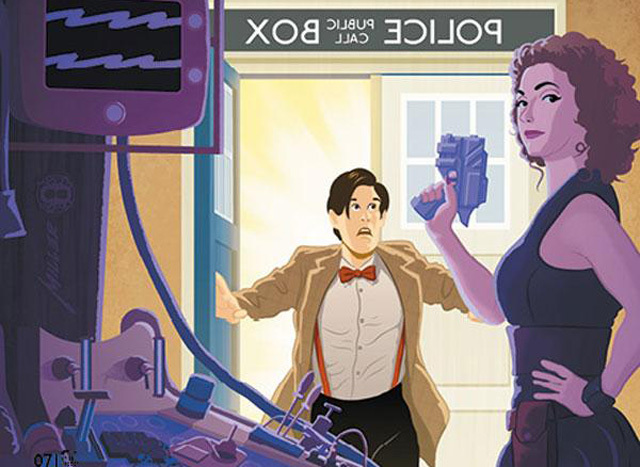 Titan Comics: Doctor Who - THE ELEVENTH DOCTOR #2.7 Review | Warped Factor - Words in the Key of Geek. Here’s to Douglas, says Tony. It’s getting increasingly difficult to talk about the Eleventh Doctor’s second year story arc without spoilering the bejesus out of anyone who’s not up to speed. That’s because the escalator of treats continues to climb – and yes, there are at least a couple of treat panels here too, even if, on the whole, it doesn’t end with the same punch as at least the last four or five issues. The big reveal at the cliff-hanger of this issue is not a who, or a what, but an oh. A realisation that the story we thought we were probably involved in is in fact not the story we’re being told, after all. That there’s something else, probably even more complicated, going on. Thank you, Rob Williams. The Doctor and his growing roster of companions explore the place they should never ever go on pain of extreme danger to the universe in this issue, in search of a thing they need to find because it will hold the key piece of information about our hero’s guilt or innocence of a genocide during the Time War, a genocide for which he was on trial way, way back when the universe was innocent and young – six issues ago – but of which he has nothing but the haziest of memories, the events forming part of the inconveniently time-locked Time War. We say all this because there’s every temptation as the issue-count of this escalating storyline mounts to forget what the hell it’s all in aid of in the first place, as we scrabble for the next jewel to prod our nostalgia-buttons (general note – nostalgia-buttons should be stroked rather than prodded, whenever possible) or boggle our eyeballs. In fact, there’s a sense in which it would be possible to accuse Rob Williams’ story of being composed of random notes picked out of the nostalgia-bin, so it’s actively important to try and keep hold of the purpose behind it all. The purpose behind it all, remember, is to discover what really happened to the Cyclors, back in Ye Olde Timey-Wimey War. We don’t find that out in this issue, though we do find the relic from the eighties that has been popping up occasionally for a handful of issues to do the nostalgia-button strokey thing, and it delivers some top class nostalgia again here, with an additional dash of Pertweean style and, to be honest, a little very early Moffat too, which could freak you out unless you’re prepared for it. There you go, you’re prepared for it. There are other treats in store too, including a chatty but semi-depressive computer operating system that feels like an homage (which is the polite way to say it’s ‘borrowed with extreme prejudice’) to Douglas Adams in probably the most fitting location in the universe. There’s, if perhaps nothing quite so vulgar as an explanation of the Squire, the Time War companion the Doctor can’t remember, then at least some extra information regarding her that seems to point us in a direction, and a question about her true nature which is belatedly asked but goes as yet deliciously unanswered. We also get a couple of treat panels in terms of the way in which the most insadvisable date-location in the universe protects itself from the flotsam and jetsam of space travellers just popping in and stealing all its secrets. There’s an elegance to its defence mechanisms that resonates on a logical level and, quite apart from that, allows artists Leandro Casco and Simon Fraser to go properly to town, not only bringing a little more nostalgia to the party, but also painting us some alternate timelines for the companions. The Then and The Now is still knocking about the place too, popping up from time to time and in this issue coming across a little more in action hero mode than we’ve seen it in previous issues. It still looks pretty damn cool, but more and more, we begin to wonder about the legends surrounding it – a creature that destroyed its own timeline, leaving it with no history and no future. You might want to keep that in mind, given the revelations that come in this issue. Oh, also, there are robots. Fairly meaningless, standard-issue recent-Who robots, with legs like ballerinas, heads like teaspoons and bodies like Iron Man’s harder older brother. If nothing else, they allow Abslom Daak to do something in this issue, though still not a very great deal. 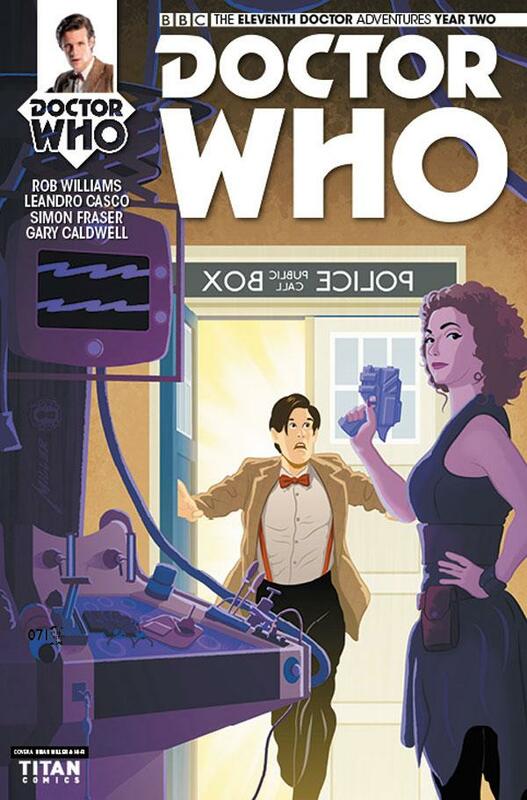 If there’s an issue with the storytelling at this point, that’s it – the fuller the Tardis, the tougher the gig it becomes to give everyone something meaningful to do in each issue, and Williams doesn’t pander to such petty rules of character activity, meaning some characters like, this time around, Alice and Abslom feel a little extraneous on the page. Since Daak returned to the Doctor’s world, there’s been quite a lot of guard duty in his life, and it feels, if we’re going to get niggly, like a bit of a waste of such a gloriously demented character. Occasionally having him drool and slaver at an opportunity to kill things is all very well, but it still doesn’t feel like enough use if being made of him. Right now, Abslom Daak has a feeling of being prime fillet steak thrown into an incredibly rich beef stew – it’s decadent as all hell, and it’s amazing that he’s in there, but still it feels like a bit of a waste of his mayhemic skills. If we’re going to be ultra-picky – and why the hell not? We’ve started now – there’s an odd choice of credit-break point in this issue too, with events on the far side of the break getting a bit Tenth Doctor, all black and white and history lesson, though again, it gives Casco and Fraser an excuse to extend the range of techniques they show us, rendering the black and white stuff with a crispness occasionally missing in some of the more workaday motion panels in the rest of the issue, and giving them another chance to dazzle us with a panel of nameless villainy that looks altogether like a Convention of the Sith, which is no bad thing in itself. Continuing in the picky vein, there’s either a typo or a clue here, with the Doctor mispronouncing Cyclors as Cylors. Watch this space to find out whether that’s a lettering slip-up or something of significance. Significance is the point, really – for the first time in seven issues, we end on a downbeat note here, no new nugget of nostalgia or hellyeah to throw into the gumbo, but a kind of shrouded seriousness that has a feeling of the Eleventh Doctor’s trademark sulk in The Snowmen, that sort of ‘leave me alone, all of you, I’ve got miserable to be’ vibe that could well overshadow the next few issues, although, given the Next Time summary here, whether it’ll be allowed to do so is a whole other matter. In summary then, this is an issue that’s lacking the ‘pow!’ ending of recent instalments of the Eleventh Doctor comic-book, but to be honest, that’s something of a relief because after all, too much prodding of the nostalgia-button causes redness and chafing. It’s also an issue where Daak feels like several hundred pounds of wasted sociopathic beefcake, and we learn something about the Squire, even if we’re not sure as yet what the meaning of it is. It’s still an issue worth getting, for some cool signature panels, especially the defence mechanism panels, and because if you didn’t, you’d always wonder what the hell you’d missed. Go get it now, and raise a quiet Pan-Galactic Gargle Blaster to Douglas Adams with us.